In every highlighter hue you can name, these two-day-old chicks are going cheep at a market near you. 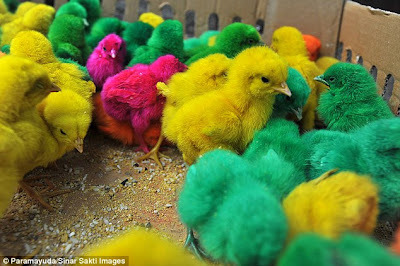 That's provided you live in Indonesia, where day-glo chickens are the very latest craze. 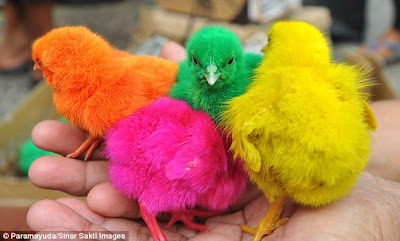 Pictured at a street market in the capital, Jakarta, the rainbow-coloured balls of fluff are shown in bright green, orange, pink and yellow. Dyed with permanent spray paint, they sell for 33 pence each. 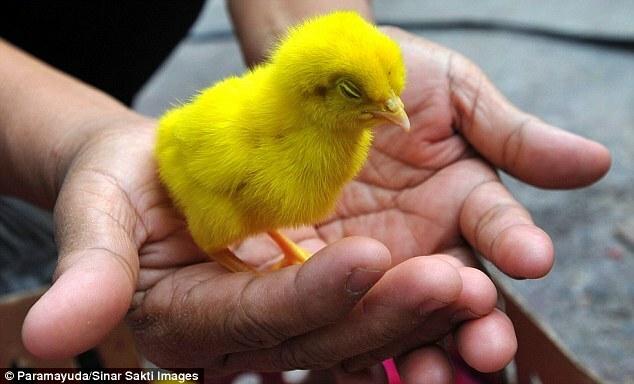 While the trend may seem cruel to some, local photographer Himawan Paramayuda explained that chickens occupy an important role in the South East Asian country. Many families in Indonesia have an income below one U.S. dollar per day, and keep chickens at home for their eggs and meat.